If you look at the picture above you can see how the very prolific climbing rose 'Wedding Day' works its magic, cascading over trees, walls and pergolas. Fill your garden with the scent of roses. 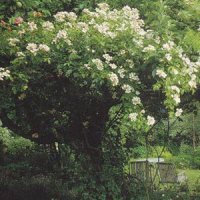 Low-growing roses are widely available with many different varieties from thirty centimetres to one and a half metres high. These plants spread outwards rather than upwards, and some form wonderful carpets of flowers. 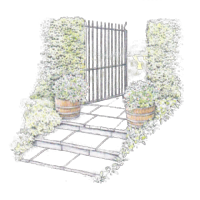 Many can also be used to create hedges upto one and a half metres high and lose no time in covering banks, rock gardens and other inaccessible places. They can also form decorative mounds that can be used to hide unsightly garden features such as old tree stumps and manhole covers. Ground-cover roses usually need little care and attention and are extremely hardy. This is particularly true of 'landscape' roses, a category bred for ornamental use in towns, parks and roads. Make the most of their sturdiness to protect vulnerable areas of your garden - for example, use a thorny variety like Rosa 'Paulii' to stop animals getting into your flower garden. To keep the roses in their horizontal state, shear them regularly. Don't worry about cutting off buds as new flowers will soon follow. Cascading roses: If you want to train roses over a high wall, choose vigorous varieties such as 'Madame Alfred Carriere', which is white, flushed with pink. 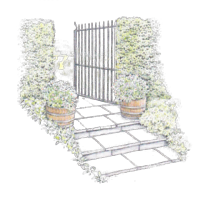 'Wedding Day' and 'New Dawn' bloom profusely and will cascade over pergolas or gazebos. 'Aloha', an elegant, old-fashioned-looking modern rose, is very fragrant and can be trained as a short climber. diameter and sixty centimetres deep. A bush rose - a hybrid tea or floribunda - will need a planter that is forty centimetres in diameter and fifty centimetres deep. Miniature roses will thrive in smaller planters, around thirty centimetres deep. Don't forget that these sizes are for young plants. 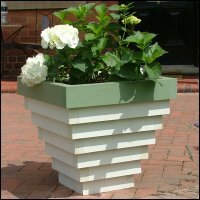 As your roses grow they will need to be transplanted into progressively larger planters . Surround your ponds: Ramblers and ground-cover roses create an effective and attractive barrier around water. Plant them in large groups around the edge of a pond - in planters or in the ground about forty centimetres apart to prevent children from leaning over the water or discourage pets from jumping in. Roses will also attract a variety of birds and wildlife to the water, making your pond a natural haven. Spring display: Roses can be preceded in spring by a display of primulas, columbines, anemones and hellebores. 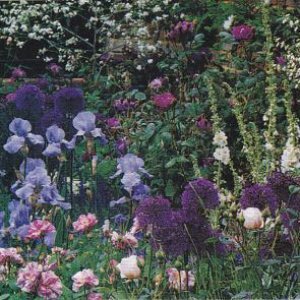 Extend the rose flowering season by planting agapanthus, aster, campanula, geranium, hosta, iris, lilies, oenotheras and salvia. Fennel provides an excellent backdrop for shrub roses, and tarragon looks good under bush roses. These tall plants create bold contrasts. Choose colours that highlight your roses, for example purple irises look stunning with yellow or orange roses. 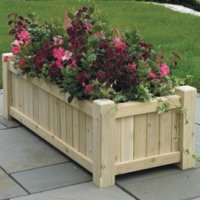 Many shrubs make good companions for roses, including Viburnum carlesii and V. mariesii, hydrangea, honeysuckle, weigela, oleander, ceanothus, eleagnus, abelia, hibiscus and clematis. Plant an edging of dwarf box (Buxus suffruticosa), blue or white lavender, or nepeta to give your rose beds the perfect finish.